Harry Sears, my uncle, and the husband of Patricia Mullen Sears, died last weekend as a result of complications caused by cancer. His viewing was held last evening and, to no one's surprise, the line of mourners who came to pay their respects stretched outside the funeral home for hours. A wonderful obituary, crafted with love and care by his family, is attached below. About the only thing that I can add to it is my own recollection of his sense of humor and devotion to family. Uncle Harry rarely missed a Mullen Christmas party, from the time that these gatherings were held at my Uncle Nick's house up to the parties that are held each year at my house. Uncle Harry and Aunt Pat were fixtures at these parties. As to his sense of humor, well, let's just say that I was never quite sure when he was pulling my leg. On two occasions, Uncle Harry became the star of my "Mullen Christmas Recaps". Click here and here and make your own decision. Uncle Harry lived a good, long life and was loved by everyone he touched. He will be missed and remembered by all of us and, at the end of the day, what more can you ask from life? Harry C. Sears, father of six, passed away Saturday, Feb. 20, 2010, after several months of battling cancer. He persevered for more than a decade with Parkinson's disease as well. He was 81. He was the beloved husband of Patricia Mullen Sears. He was the best father to Timothy Sears (Lisa), Colleen Kada (Steve), Sharon Slusarski (Mark), Patrick Sears, Shawn Peikin (Doug), and Daniel Sears (Donna). He was the awesome Pop Pop of Taralyn, Kerriann, Shaun, Brendan, Dennis, Riley, Cassidy, Jade, Madelyn, Zachary, Christopher and Jake. He is also survived by his sister, Frances Lorraine Cerritelli. He was preceded in death by his grandson, Dennis, and his sister, Anne Curry. Harry C. Sears was born on Sept. 14, 1928, to Francis J. and Florence Sears of Philadelphia. Because of Harry's Christening, his father switched work days with a co-worker. Francis was employed by the federal government as a U.S. Treasury agent during the prohibition years. On October 28, the day that Francis worked for his co-worker, he was killed in one of Philadelphia's most publicized fires at Publicker's Alcohol Plant. Harry attended LaSalle College High School on scholarship and graduated in 1946. He was a lettered member of their legendary crew team which rowed out of Vesper Club on Boathouse Row. Harry was a devoted son to Florence Sears who died in 1983. He lived with Florence until he met and married Patricia Mullen, "the most beautiful woman he ever saw," in 1956. They moved to Willow Grove in 1961 and immediately registered at St. John of the Cross Parish, where they and their six children were active members. After college he began his construction career with a small survey company. On his first day, his co-workers had a good laugh when he showed up at the muddy job site meticulously dressed in a suit and tie. In less than two years he progressed to the position of lead surveyor. During the post-war construction boom he worked in the development and expansion of the Philadelphia and surrounding suburbs infrastructure. Harry's intellect and affinity for mathematics made him an ideal construction estimator. On July 3, 1961, he began his career at James D. Morrisey, Inc. Harry secured for JDM some of the largest private contracts in the Delaware and Lehigh Valleys. Some of his clients were PECO, United Parcel Service (at the Philadelphia airport), Bethlehem Steel, and Mack Truck. His work also at times included public road contracts including major highways throughout the Philadelphia area. While in his 50's Harry taught himself computer programming to automate much of the estimating process. He led and trained many newly minted engineers from local universities while at JDM. During the mid 1960s, he became a member of Willow Manor Players, a local theater group. He began as a member of the chorus and progressed to lead comedy roles. His all time favorite was the part of "Moonface Martin" in Anything Goes. All who remember seeing him recall his rendition of "Be Like the Bluebird" which he would perform on command for years to come for the delight of his family and friends. He also served as business manager and president for the theater group. Harry was involved in the cultural phase of CYO at St. John of the Cross Parish in the 1960s, working with high school students while his own children were still in grade school. Using his expertise with the theater group he directed One Act Plays with the teenagers, winning first place in the Philadelphia area in his second year of directing. He also directed several variety shows so all interested teenagers could participate. In the 90s he and Pat filled in as bit players in shows on Ocean City's Music Pier where their granddaughter, Kerriann Kada, had leading roles. In the 70s, Harry and his wife, Pat, were in leadership in Marriage Encounter in the Eastern Montgomery County area. They were Team Members on many Marriage Encounter Weekends, sharing their relationship with other couples. Harry and Pat also became involved with the Charismatic Renewal in the Catholic Church. They led the "Life in the Spirit Seminars" for several years and Harry taught many times. Many remember his teaching on True Humility which Harry's life exemplified. Harry had numerous talents and interests. 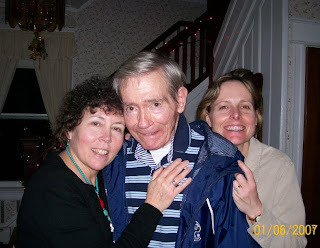 He loved to dance and especially loved the Mummer's Strut, line dances, and the jitterbug. Whether it was sketching, cooking, concrete work, playing the guitar and piano, acting, photography, carpentry (he built most of the family home), upholstery or comedy, Harry pursued his interests with a patient, persistent, and relaxed style. Whether performing his Mummer's Strut or sitting at Sunny Willow Swim Club or the beach in Ocean City, N.J., or at a restaurant, Harry was always very close to his immediate family as well as his and Pat's extended families. Harry was much more concerned with others than himself. His family never wanted for anything and lived a very comfortable existence. Despite his very busy life, Saturday afternoons in autumn belonged to Notre Dame. He usually sat on the floor watching TV, mesmerized by the game, oblivious to the confusion that surrounded him especially while the children were little. In October of 2009 his children took him to Notre Dame to watch the "Fighting Irish." Harry could never put into words his appreciation for this trip especially since he was on the field with the players as a guest of the coach. Harry's family and friends will remember him by his countless stories which embody his warmth, kindness, intellect, love, caring and probably most of all his sense of humor. Many will never forget his "Martha, the Wide Mouthed Frog" story. To know Harry was to love and admire him. He commanded the respect of all who knew him. In the words of his wife, Pat, "He is truly the finest person I have ever known. I am truly blessed to have been loved by him for 56 years." His funeral Mass will be held at 11 a.m. Thursday, at St. John of the Cross Church, 2741 Woodland Road (at Thomson Road), Roslyn, PA 19001. Interment will be in Holy Sepulchre Cemetery. Relatives and friends are invited to his viewing at William R. May Funeral Home, 354 N. Easton Road (at Keswick Ave.), Glenside, from 6:30 to 8:30 p.m. Wednesday and to his viewing at the church at 10 a.m. Thursday. Donations to LaSalle College High School Fatherless Son Fund, 9605 Cheltenham Ave., Wyndmoor, PA 19038, or St. John of the Cross Church would be appreciated. 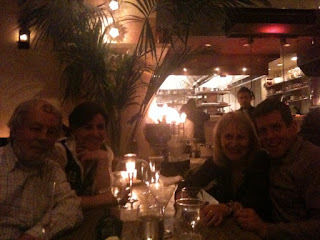 Happy Birthday, Sheila, with many more to come! Pull up a chair. Crack open a beer or pour yourself a glass of wine. This particular blog entry will be a tad longer than usual. Stick with it, though ... it has an interesting finish. While the safe itself was open, the door was in the locked position. 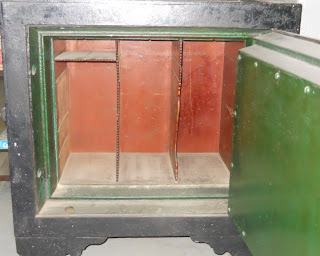 Iron bolts protruding from the bottom and sides of the door (which fit into corresponding holes on the inside frame of the safe) prevented the safe door from being closed. 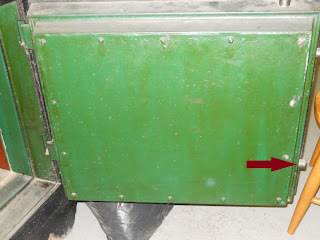 The knob attached to the front of the safe (presumably for manipulating the bolts) would not budge. 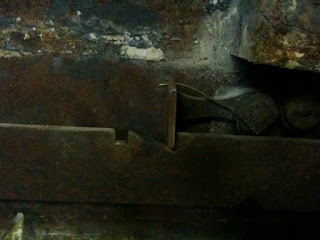 Here's a close-up of the inside of the door with an arrow pointing to one of the troublesome bolts. 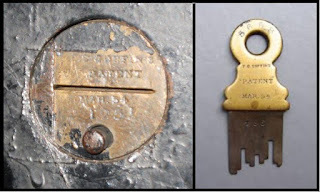 The safe had a funky lock on the center of the door with a thin slit in it to insert a key. Miraculously, we actually had that key! It was with a pile of other old keys that the previous owner had left us. Inserting the key into the lock caused a small metal button on the lock itself to pop out, but it didn't unlock the door. 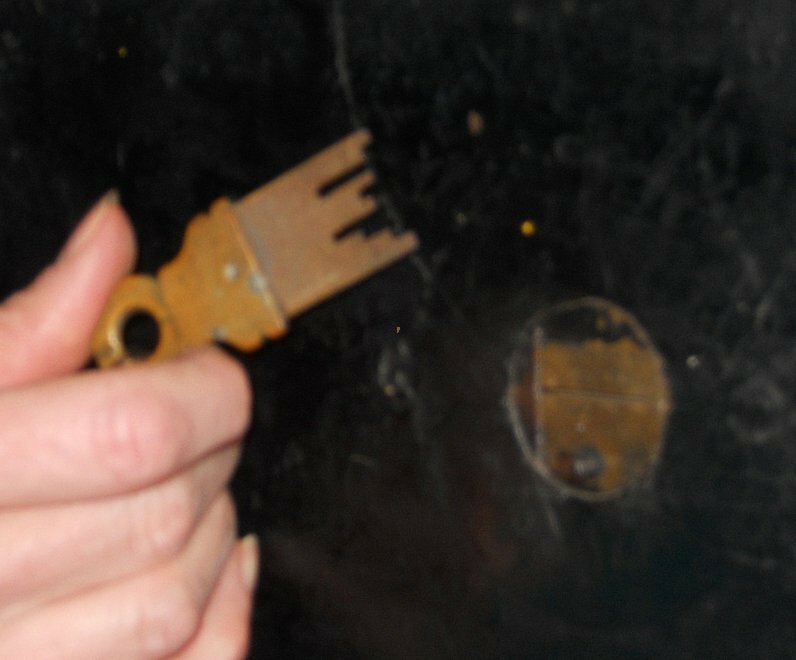 The knob on the safe still refused to turn and the rounded bolts protruding from the door could not be retracted for love nor money. That left us with a safe that could not be closed, i.e., a worthless safe. In truth, it wasn't an entirely worthless safe. 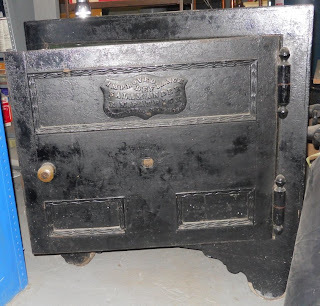 It had a purpose, albeit one that its 19th century makers could not have envisioned. For about 15 years, it functioned as an incredibly sturdy TV stand for a black and white television hooked up to a Nintendo console. It also doubled as a storage chest for all of our kids' Warhammer armies. Sadly, it had lost most of it's glamour over the years, but don't we all? A few years ago, in order to make room for some additional exercise equipment in the basement, Dave and I managed to roll it under the basement stairs. It wasn't easy to maneuver that beast, let me tell you, but we did it. And I had no intention of ever moving it again. But fate intervened. Last month, following Mullen Christmas in Cranbury, my daughter, Sara, and her husband, Pete, returned to Rhode Island and discovered that their house had been burglarized. The thieves ransacked the place and managed to find all of their most expensive possessions wherever they were hidden. The very next day, Marilynn and I rolled the safe out from under the basement stairs and gave it one more look. My plan was to learn as much as I could about it and enlist the aid of a locksmith to fix it. A "Salamander Safe" refers to a fireproof safe, so named because the salamander, according to myth, is supposed to be able to endure fire without harm. R.M. 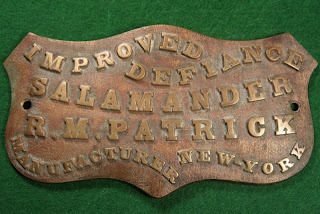 Patrick was a manufacturer of Defiance Salamander Safes at 192 Pearl Street in New York City. While all of this was great information, I was amazed and frustrated by my inability to find any information at all about my particular safe. Having details about the lock was fantastic, but it would have been nice to know how that lock had been integrated into the safe. This lack of information would come back to haunt me later. My next order of business was to contact a competent locksmith who specialized in antique safes. After a few searches on the web I found a site called AllExperts that looked promising. I entered my problem on the website and, within a few hours, received a response from a safe expert in California. After exchanging a number of emails, the California expert -- after expressing his regret at not being able to work on my safe personally -- gave me the name of an individual in New Jersey that might be able to help me, a guy by the name of Jeff Sitar. I searched the web and found Jeff's email address and phone number. I sent him detailed information about my safe but received no reply. So I gave him a call and left a message on his answering machine. Still nothing. I was just about ready to give up on Jeff when he returned my call at 8pm one night. (It turns out that Jeff is a pretty busy guy!) I described the Salamander safe problem to him and he was immediately interested. He then pointed me to his website which described him as a championship safecracker, and I was immediately interested! After a number of abortive attempts to meet, I finally got Jeff and my safe together last Saturday. The results were truly astounding. 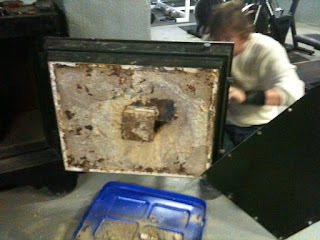 Jeff then carefully chipped away about 50 pounds of concrete to expose the locking mechanisms. I went upstairs at this point to do some work in the kitchen while Jeff tried to figure out how to raise that second metal bar. I was upstairs for no more than 2 minutes when I heard him yell, "Paul, come down here and look at this. You will not believe it!!!" As it turns out, that's a tiny bit of brass that is attached to a lever that raises the restraining bar. When the Goffin lock is open, pressing down on this brass switch raises the restraining bar and allows the doorknob to turn and extend or retract all of the iron bolts. 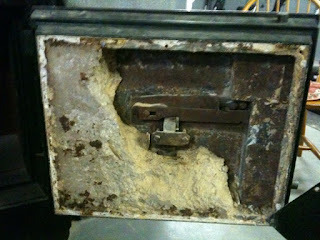 The locking mechanism of the safe was in perfect working order all these years ... we just didn't know its secret! Jeff was both exhilarated and humbled: exhilarated because, after 30 years in the trade, he had just learned something brand new, but humbled because he had to take the door of the safe apart to figure it out. Me, I was just happy to have a fully working, almost impenetrable, antique fireproof safe in absolutely perfect working order! I'm no stranger to snow. I've lived in the northeast my entire life. I was a kid when winters really were winters, when it snowed before Thanksgiving and snow covered the ground all winter long. I was in Syracuse, NY, in March of 1993 when the Storm of the Century dropped 43 inches of snow on that city in 48 hours. So why did today's "Nor'easter in NJ" shock me as much as it did? When I woke up, there were only a few inches of snow on the ground. By noon, it actually stopped snowing and it looked as though the sky was beginning to clear. Then -- Boom! 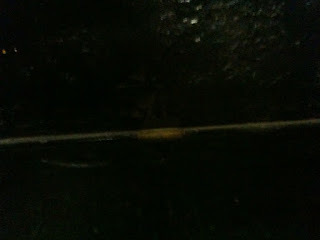 -- it started coming down fast and thick. And it didn't stop. 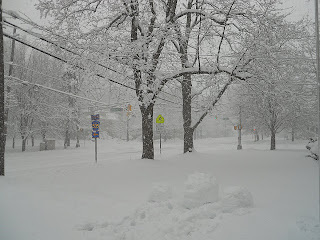 It's about 9pm as I type this blog and it's still snowing! After about 40 minutes of shoveling, we managed to clear the entire driveway. At this point, I volunteered to shovel the front walks and the porch while Marilynn did a little cross-country skiing at Village Park. 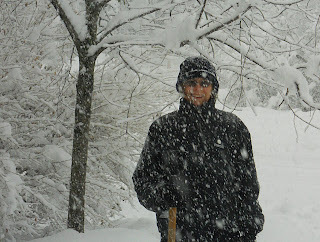 By the time Marilynn returned, I had just finished clearing the porch and all of the front walks. Then I looked at the driveway ... it was covered with a brand new 4-inch layer of snow! I had to shovel it again! Before we called it a day, though, there was one more crucial job that had to be done. For the first time in about two years, this snow was perfect snowman-making snow. 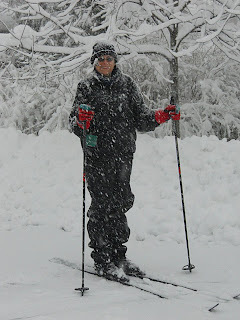 The air temperature was just right and the snow was soft and easily clumped (if that's a word). 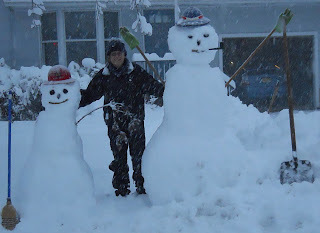 It didn't take us long to throw together a snowman (complete with pith helmet and pipe) and his snowkid. We probably should have decorated them a little better, but Marilynn and I were pretty frozen at this point. So that's about it. Marilynn is stoking the fire downstairs. We're going to pop in a DVD and ride out the remainder of this storm inside. And I'm not going to even look at that driveway again until the morning!